Edith was diagnosed with leukemia at six months, when as a breastfed baby, she was constipated over days. Her mother, Ahide Palomera, knew this wasn't normal. A hospital visit turned into weeks at her baby's side. LLS provided Ahide with three meals daily so she could be healthy enough to nourish her baby. Hospital staff cautioned Ahide that Edith may not be hungry after intensive treatments which would cause bloody sores in her mouth: "No, my baby has to eat," as she thought about care, "and Edith latched on every time. There is something so beautiful about breastfeeding a baby who is on chemotherapy." Edith is now seven years old and in remission. The chemotherapy caused minor developmental issues, which she is working through with professional and familial support. Preston Osycka was almost three years old when his mother, Jessyka Osycka, noticed his lymph nodes were extremely swollen. She, like Ahide, sensed this wasn't normal. Her mother's instinct led her to feel he had leukemia. After two visits to draw blood, it became clear Preston had Acute Lymphoblastic Leukemia (ALL). As the family's life changed, support grew. In Jessyka's network, there was a mother who had heard of LLS. She rallied a team to walk at Walnut Creek's annual evening fundraiser, Light the Night, as a show of solidarity for the Osycka family. Preston is now six years old and had his last chemotherapy treatment last October. He walks the event every year, with his parents, his little sister Rylie (in photo), and his community of light. 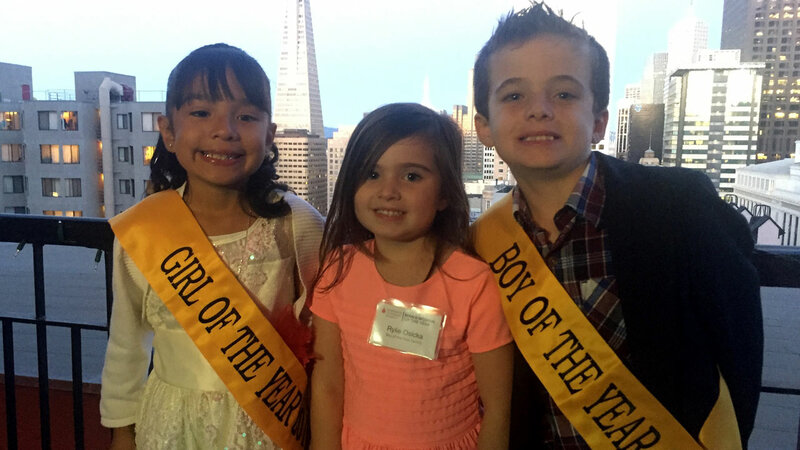 Edith, of Oakland, and Preston, of Walnut Creek, are the faces of inspiration and perseverance. They are the 2016 LLS Girl of the Year and Boy of the Year.